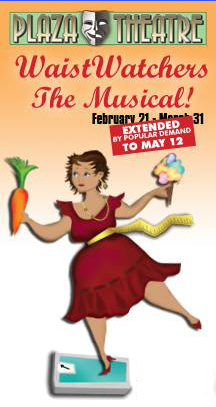 The Plaza Theatre originally opened Waist Watchers The Musical on February on February 21, 2013. After an extended run, they had to close it to make room for other productions. They brought the show back on August 1, 2013, for a run through September 1, 2013. This hilarious musical comedy with parody lyrics to well-known songs, has played to sold-out audiences across the country since 2007. Taking place in a women’s gym, four ladies work out and belt their hearts out about their struggles with diet, exercise, food and MEN! Andy Rogow directed a cast that featured Missy McArdle, Shelley Keelor, Katie Angell Thomas, and Jeanne Bennett. The musical, which is resuming its long run after a short break, has settled comfortably into a well-oiled groove. Directed by Andy Rogow with an eye toward springing as many punchlines as possible, the production is energetically performed by a cast of powerful voices composed of Jeanne Bennett, Missy McArdle, Shelley Keelor and Katie Angell Thomas. Sometimes the scenes are funny. When the lyrics and the music click, the performers make them snap. It’s impossible to resist lines such as “eat-just-what-you-want-because-it-doesn’t-matter diet,” sung to the melody of supercalifragilisticexpialidocious — especially when the performers are costumed as tempting sweets. McArdle brings down the house with her spot-on Tevye impression in If I Were a Size Two, performed to the tune of If I Were a Rich Man. Other songs are a painful stretch. Efforts such as I Went to the Buffet Line — clogging I Heard it through the Grapevine’s melody — and The World’s Greatest Ice Cream — slathered onto The Impossible Dream — sink under the weight of clumsy writing. The tinny synthesized accompaniment is another irritation. If you’re the right demographic and if all you’re looking for is 90 minutes of forgettable laughs, you’ll probably enjoy this show. All others might prefer to abstain. Orlando’s Jeanie Linders hit theatrical pay dirt a dozen years ago when she put together a show of parody songs and dubbed it Menopause the Musical. Producer Alan Jacobson is clearly following Linders’ formula with Waistwatchers the Musical!, which has just opened at his Plaza Theatre in Manalapan. The show, which debuted at the Maltz Jupiter Theatre in 2007 under the title Food Fight, has already been extended to mid-May -- an enormously long run by South Florida standards. The audience, so predominantly female that you have to look hard to spot a guy, eats the show up. Critics? Not so much. ...the dialogue is nothing more than glue to hold those parody songs together. Jacobson’s new lyrics are set to easily recognizable Baby Boomer-friendly melodies. ABBA’s Dancing Queen becomes Botox Queen. The Impossible Dream turns into The World’s Greatest Ice Cream (Ben & Jerry’s Chunky Monkey wins top-scoop honors). The beautiful Maria from West Side Story is way less moving after morphing into Viagra. Despite the limitations of the material, director Andy Rogow, choreographer Kevin Black and the talented cast work up a sweat selling Waistwatchers to the appreciative, none-too-picky audience. The curvy McArdle gets several showcase musical comedy moments, including If I Were a Size Two, set to the tune of If I Were a Rich Man from Fiddler on the Roof. Keelor scores with Lazy, an exhausted exerciser’s version of Crazy. Thomas’ guy-juggling Carla turns I Am Woman into I Am Cougar, though she doesn’t look old enough to be doing any cradle robbing. Bennett amusingly croons Viagra, though her show-and-tell “choreography” with a gym towel is more than the song needs. Plaza Theatre producer Alan Jacobson insists he was not trying to emulate the mega-successful girl-power song-parody revue Menopause, the Musical when he wrote Waist Watchers, the Musical, but the two shows could not be more similar if he had overlaid one on top of the other and used a template. That is not necessarily a bad thing. Your reaction to Waist Watchers probably will echo your opinion of the earlier show, and judging from the frenzied, almost entirely female audience I was among in Manalapan recently, The Plaza has a commercial hit on its hands. Director Andy Rogow, who has been attached to the show since it premiered six years ago under the title Food Fight, knows the importance of casting talented, energetic women who are committed to selling this only intermittently entertaining material. McArdle seems to have the show’s best numbers or she delivers them more disarmingly than the others. She certainly earns a rousing reaction from the audience singing the wistful If I Were a Size Two, sung, naturally, to the tune of Fiddler on the Roof’s If I Were a Rich Man. It is one of some two dozen songs based on pop music hits and Broadway standards. Unfortunately, once the lyric’s initial spoofing twist is stated, the rest of the number is usually just repetition. Still, the cast delivers the score with gusto, aided by Kevin Black’s athletic choreography.